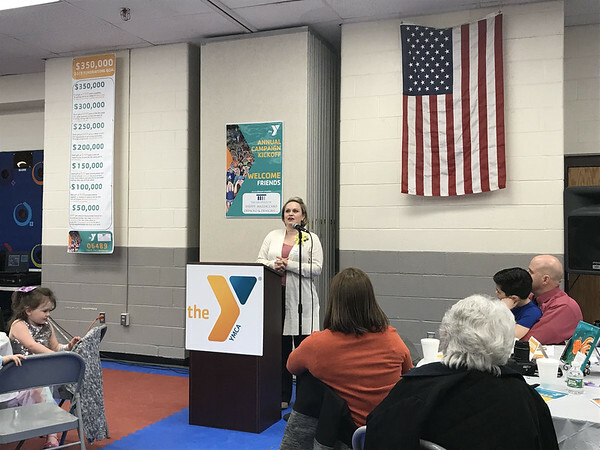 SOUTHINGTON - The Southington Community YMCA kicked off its 2019 capital campaign Thursday morning, sharing stories of lives positively impacted by its programs as it appealed to residents to help them reach their $350,000 fundraising goal. The campaign kickoff event, titled “The Y. For a Better Us” featured the town’s ZIP code, 06489, prominently on event flers - which was later explained in a video that said that the Y seeks to provide people with services and opportunities so that their destinies are not determined by their ZIP codes. 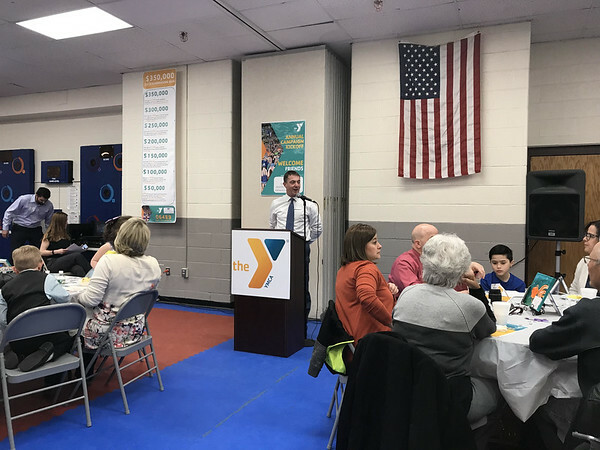 The morning began by children in the YMCA’s before school care program leading the Pledge of Allegiance, after which YMCA Board President Paul Bedard welcomed the guests. He introduced Tony Sheffy, who is the campaign’s sponsor. Sheffy and his wife have both served on the Y’s Board. 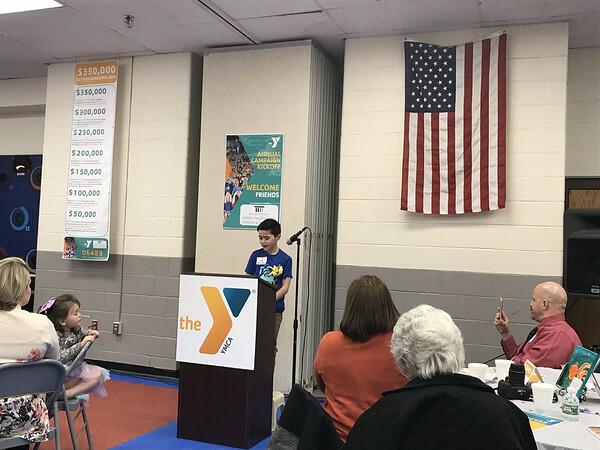 He said that the Southington Community YMCA is the “fabric that holds the town together.” He encouraged residents not to “rest on their laurels” but to give their “time, talent and treasure” to ensuring that the YMCA can continue to be successful. Bedard further reinforced that the Y is dedicated to closing “opportunity gaps.” He said that last year the organization provided 97 scholarships to families in need of child care, outreach to 40 kids each day in “at risk neighborhoods”, 156 families with membership scholarships and camp to 358 local children. Jim Earl and Linda Maxwell also encouraged people to donate, with Earl saying that the Y uses donated funds wisely. “Your donations don’t pay our electric bill or put chlorine in our pools - they go directly to those in need,” said Bedard. Bedard said that 5 percent of town residents live in poverty and 1,000 residents are unemployed. 148 infants and children are on the WIC program, 1,600 residents are on SNAP (food stamps) and 28 percent of residents live at or below ALICE (asset limited income constrained employed) levels, where they struggle to budget for basic survival needs. A series of people were then invited up to share stories of how they had benefitted from YMCA programs. Tresa Baczewski, a participant in the YMCA’s Livestrong program, explained how, when she was diagnosed with breast cancer and underwent a double mastectomy and 25 radiation treatments, she found a sense of community, companionship and inspiration in the fitness program. She said that it gave her hope, improved her physical and emotional health and helped her to not feel defined by her cancer. Ben Beaulieu, a nine-year-old triathlete who has participated in the Race4Chase for the past three years, then talked about how his coaches helped him to push himself and how he made friends training and participating in the event. Race4Chase is held annually at YMCA Camp Sloper in memory of Chase Kowalski, who was killed in the Sandy Hook shootings. Jolene Miceli, healthy initiatives coordinator with the Y, recalled how children were training for the triathlon by running up a hill. Ben, once he reached the top, asked if he could do it again to train harder and got other kids to do the same. Mark Pooler, CEO of the Y, said that starting June 1, he and 25 other people will be running 2.6 miles each day in memory of the 26 victims of Sandy Hook. Each will raise $350 to support the $15,000 needed to support the Race4Chase. Tamara Lathrop, a YMCA scholarship recipient, explained how, as a single mother of three and an EMT, she found herself in a desperate situation where she was living in motels and running low on savings. The Department of Children and Families was threatening to take away her children. The Y was able to help her take care of her children while she attended community college to become a licensed paramedic. Once she got an apartment in downtown Southington, residents chipped in to help her furnish it. “It is thanks to the help of the YMCA and the Southington community that someone like me can grow and provide a better life for my family,” she said. Posted in New Britain Herald, Southington Herald on Sunday, 7 April 2019 21:06. Updated: Sunday, 7 April 2019 21:09.